A number of the Hawson family were involved in the two World Wars. Listed below are some details. If anyone would like to add any more information on family members involved in any miltary combat, please contact me here. b. 8 March 1888, Lake Wangary, West Coast, South Australia. Son of George Gregory Hawson and Adelaide Standley. Killed in action, 7 October 1917. Buried were he fell on the Western Front, at Ypres, near the Belguim border – to the best of our knowledge (G.E. Barry). Notes: HAWSON, Pte. Gerald Stanley, 5588. 27th Bn. 7th Oct., 1917. Son of Matthew Hawson and Catherine Houston. Died of wounds, 12 June 1915, at Gallipolli. Notes: HAWSON, Tpr. Alexander Lincoln, 273. 9th Australian Light Horse. Died of wounds 12th June, 1915. B. 14.
died of wounds, 2 January 1943, Papua. HAWSON, Sergeant, EDWARD JOHN, TX860. A.LF. 2/12 Bn. Australian Infantry. 2nd January 1943. Age 29. 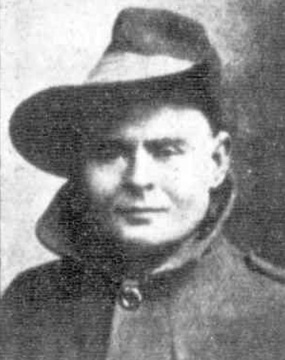 Son of Reginald James Hawson and Mabel Hawson, of Hobart, Tasmania. B8. C. 26.